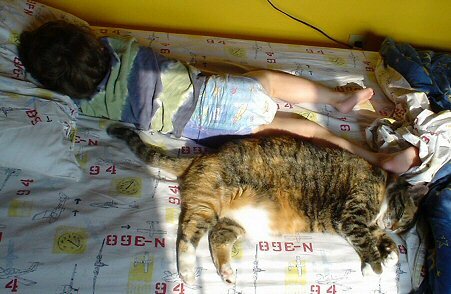 If catblogging is so great, I’ll try cute child and cat blogging. This is my backup boy, “Boy Two” and our primary cat, “Secant” (the backup cat is named “POset”). I’ve also noticed that Tightly Wound gets more comments on her boy posts than on the other ones so I figured I’d give it a try. I’m a bit burned out otherwise and don’t have much to say.